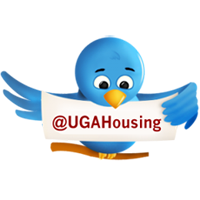 It's Diversity Awareness Week at the University of Georgia and we at housing have several fun and interactive programs in place that will SHOCK your senses with dialogue, interactive learning, story sharing and much, much more. Have you ever thought how different it would be to experience everyday life as a disabled person? Come out and experience a meal like never before! O-HOUSE BASEMENT, 7 p.m. - 8:15 p.m. Residents will engage in an interactive game show- Jeopardy style! Residents will be asked questions surrounding UGA’s history and MORE! This program highlights diversity through experiencing different international meals that will SHOCK your taste buds! MYERS PROGRAMMING ROOM, 6 p.m.
Come out to the Creswell TV Lounge for a fun, interactive activity followed by a in-depth discussion about breaking the boundaries of gender. CRESWELL TV LOUNGE, 6 p.m.
Shows how participants have been taught to think as members of an identity group and provides skills for bridging differences. Our goal is to create an inclusive community by bringing groups together to promote healing, encourage togetherness, and strengthen leadership. This workshop is four hours long and dinner will be served. To attend you must sign up by emailing ncbi@uga.edu. 1516 MULTIPURPOSE ROOM, 5 p.m. – 9 p.m.
Payne and Reed Hall will be transformed into an interactive recreation of the Underground Railroad in which participants learn first-hand how it feels to flee slavery in search of freedom. The goal of this program is to truly appreciate the liberty we enjoy today. FOOD and T-SHIRTS will be available. REED HALL LOBBY, 6 p.m. Performers from UGA’s ASURA or CHAMPA dance group will perform and teach residents how to do a couple of Indian Dance moves. Food will be served from TASTE of INDIA. ROOKER FIRESIDE LOUNGE, 7 p.m. Representatives from various religious organizations on campus will come together for an open discussion of various aspects of this diverse topic. Come with an open mind and willingness to learn. Food will be served. ROOKER FIRESIDE LOUNGE, 7:30 p.m.
Wednesday, March 28, 2012 – You don’t want to miss this! 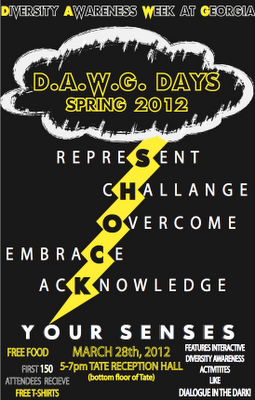 University Housing and the Residence Hall Association present: Shock Your Senses! Featuring interactive diversity awareness activities like “Dialogue in the Dark!” Come out for free food and shared fun! The first 150 attendees will receive FREE T-SHIRTS! TATE RECEPTION HALL (bottom floor of Tate), 5 p.m. The Game of Life: Disabilities is an interac- tive game that gives students an idea of the struggle and challenges faced by those disabilities both seen and unseen. FUN and INTERACTIVE! Have you ever seen the movie Crash? This program gives you an opportunity to see an award winning film that’s filled with a number of controversial issues. During the movie, viewers will be asked to send their thoughts to an online poll. After the viewing, we’ll break down and discuss how the movie relates to the issues in society today. So come grab a bag of popcorn and speak your mind! TATE GRAND HALL, 7 p.m. – 10 p.m.